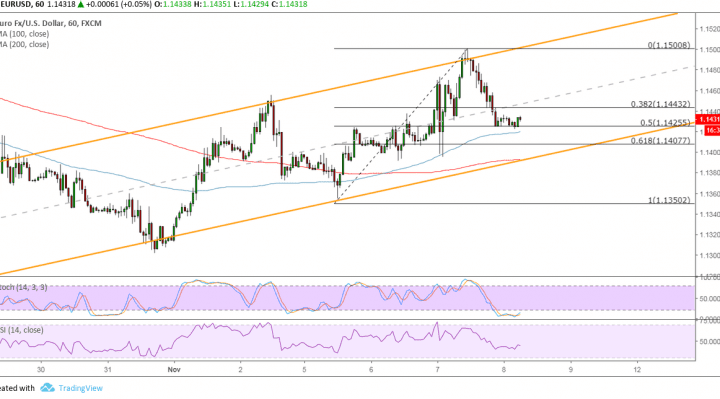 EURUSD is starting to trend higher as it forms a new rising channel on its 1-hour chart. Price just bounced off the resistance and a test of support may be in order. Applying the Fib retracement tool on the latest swing low and high shows that the 61.8% level lines up with the channel bottom where buyers might be waiting to join the climb. This is also near the 1.1400 major psychological level. The 100 SMA is above the longer-term 200 SMA to confirm that the path of least resistance is to the upside or that the uptrend is more likely to resume than to reverse. The 200 SMA is in line with the channel bottom to add to its strength as a floor. Stochastic is already indicating oversold conditions or that sellers are tired and buyers could take over. RSI has room before hitting the oversold area but already seems to be turning higher to indicate that bulls are eager to return. In that case, the 50% Fib might already hold and push EURUSD back up to the swing high near 1.1500 or the channel top at 1.1520. Risk appetite seems to be returning to the markets on fading geopolitical jitters, although the euro zone still has to contend with Brexit negotiations and Italy’s debt troubles. Also, the latest batch of leading indicators hinted at a slowdown in the region’s growth, possibly preventing the central bank from hiking in the foreseeable future. Meanwhile, the dollar is looking forward to the FOMC decision even as no actual change is expected this week. Traders are hoping to glean stronger clues for a December hike, but any effort to downplay the odds might lead to a decline in the US currency. Confirmation from hawkish remarks, on the other hand, could spur a break below this channel bottom.